SHSU President James F. Gaertner threw a strike on the "first pitch" of Wednesday night's Astros/Reds game at Minute Maid Park in Houston. Gaertner was relieved by Roy Oswalt, who got the win. 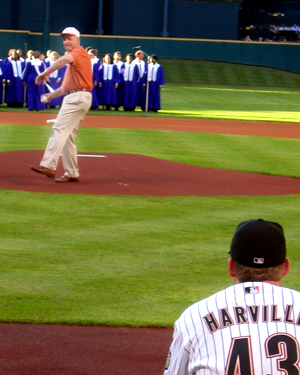 James F. Gaertner, SHSU president, threw out the first pitch in Wednesday night's Sam Night at Minute Maid Park. Some 120 Bearkats took two busses to the game for the event sponsored by the SHSU Office of Alumni Relations, while other alums in the Houston area took advantage of discounted tickets and were in the crowd of 31,571. 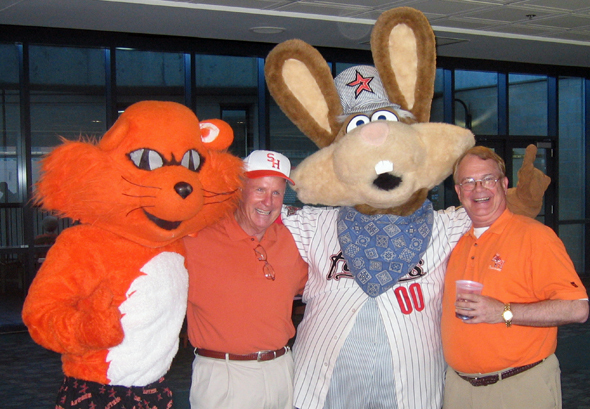 From left, Sammy Bearkat, SHSU President James F. Gaertner, Astros mascot Junction Jack, and SHSU Vice-President Frank Holmes visit during the Bearkat alumni reception prior to Wednesday's Astros/Reds game.